On this page, read an overview of the program as well as see a detailed day-to-day itinerary. Read about Dan Winter's lecture series, view video of past study tours, and read about the sites we will tour. Logistical information such as accommodations, how to pay, and what to bring can be found by tapping the links above. What do the Holy Grail, Mary Magdalene, The Da Vinci Code, The Cathars and Templars, Rennes-le-Chateau, The Golden Ratio, Alchemy, Pharaohs, Freemasons, ancient scrolls, and scientific and modern physics all have in common? The only way to find out is to come to the South of France to explore and study with one of the leading experts in Ancient Mysteries, Dan Winter. Or you might just wish to come for the French food and countryside! We invite you to unveil the mysteries of the South of France. Follow the Celtic Trail of the Holy Grail. Become acquainted with sacred Cathar sites and Sacred Geometry. Attend seminars in a Sacred Geometric Dome. All while staying in a villa in the South of France. 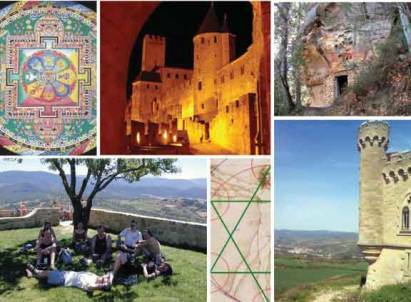 Participate in a three-day seminar with Dan Winter, Bliss teacher and Sacred Geometry genius, followed by a three-day tour tracing the mysteries of the holy grail, unraveling The DaVinci Code sites, and discovering the who, when, what and where of the Cathars. Join us for an exciting exploration "cosmic physics". 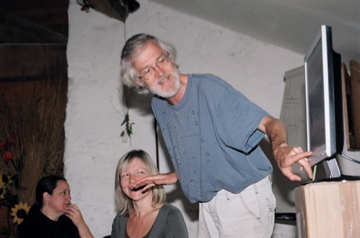 "This has been a sublime blend between the science of coherence, bliss and fractality with the lived life experience of all aspects of the program. It turns out that this program has been a path of initiation as much as a teaching program. I wholeheartedly recommend this inspirational seminar to all who feel the inclination to come." "I could not say this because I was so emotional. I once had a dream of a beautiful planet and I have seen the realization potential with the group that has been manifested." "I found this group lit a fire in me to realize bliss. I thank Mother Earth for bringing this group together and may Mother Earth give the organizers a lot of energy to do many more such groups." Read more testimonials here. View more photos in our photo gallery. Particular emphasis is placed on the pent Golden Ratio symmetry in the star maps of Rennes and others in the region. We have three days of site visits, on which we leave after breakfast, have lunch on site, and are accompanied by expert tour guides who engage us in historic dialog. Time is allocated for meditation and ritual on some sites. All are welcome to participate in the Conclusion Ritual of the Ophanim, which features the 7/5 Flower Ritual Dance. As with the Great Pyramids, Rennes-le-Chateau is linked to the bloodline of the keepers of the sacred information, i.e., the blueprint for the architecture of this reality -- and where we are going. Visitors come to Rennes-le-Chateau in order to activate their DNA and thus remember who they are and why they are here as we evolve through the alchemy of time. Rennes-le-Chateau is located in Languedoc, an unspoiled area of southern France. There are many mysteries surrounding Rennes-le-Chateau and its late priest, Berenger Sauniere, that link the village with coded parchments, the Holy Grail, the Ark of Noah, the Ark of the Covenant, and the treasures of the Temple of Solomon. It is of no little significance that there are 40 square miles of sacred landscape geometry surrounding Rennes-le-Chateau. An adjacent village to Rennes-le-Chateau, Rennes-les-Bains is home to a renowned hot springs and the mysterious Fauteuil du Diable (the Devil's Armchair), a large boulder carved in the shape of a throne. Both the Devil's Armchair and the nearby spring figure strongly in the mystery of Rennes-le-Chateau, The Da Vinci Code, and the secret location of the Holy Grail. We particularly note the pent Golden Ratio symmetry in the star maps of Rennes and others in the region. We have three days of site visits: we leave after breakfast - have lunches on site - accompanied by expert tour guides along with historic dialog. Plus we allocate time for meditation and ritual on some sites. Conclusion ritual - includes the special 7 / 5 Flower Ritual Dance - of the Ophanim. The ruins of Mont Segur are perched at a precarious 1,207-m altitude in the heart of France's Languedoc-Midi-Pyrenees regions. 80 km southwest of Carcassonne, Mont Segur dominates a rock formation known as a pog -- a term derived from the local Occitan dialect meaning peak or mountain. 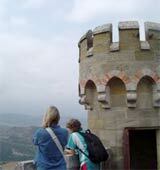 In 1243-1244, the Cathars were besieged at Mont Segur by 10,000 Royal Catholic French troops. In March of 1244, the castle finally surrendered and the Cathar defenders were burned en masse in a bonfire at the foot of the pog. However, in the days prior to the fall of the fortress, several Cathars allegedly slipped through the French lines carrying away a mysterious "treasure" with them. While the nature and fate of this treasure has never been identified, there has been much speculation that it could have easily been the Holy Grail. The château at Peyrepertuse is the dominating feature of the Languedoc countryside, visible for miles around and grafted so closely to the rock on which it stands that it seems to blend into the mountain itself. Peyrepertuse was never subjected to siege or attack during the Albigensian Crusade against the Cathars; it fell nevertheless to French forces in November 1240, through negotiation rather than force of arms. Looking to the east from Peyrepertuse, you will see the château of Queribus perched on its crag, witness to the fact that it was the last of the Cathar strongholds to fall in 1255. It is still probably the best preserved of the border castles, and the most inaccessible. Carcassonne is at the crossing of two major traffic routes used since Antiquity: from the Atlantic to the Mediterranean and from the Massif Central to Spain. The town is divided into two, quite separate parts. The Cité occupies a plateau on the right bank of the Aude. The Bastide Saint-Louis lies on the left bank. The old district of la Trivalle and the famous Old Bridge have been, from that time, the links between their two destinies. Carcassonne has inherited 2,000 years of history and invites you to discover its heritage of fine monuments. We will conduct a special tour of the Celtic Dolmen in the shadow of Saint Martin du Canigou, a monastery atop the tallest of the Pyrenees mountains. Special Tour: Celtic Dolmen in the shadow of St.Martin du Canigou. From Taurinya we will venture to one of the loveliest abbeys in the country, Saint Michel de Cuixa. Dating from around 1000, the abbey was attacked during The French Revolution but has retained much of its former glory. With its beautiful crenellated tower silhouetted against the wooded slopes of Canigou, Saint Michel de Cuixa inspires a sense of wonder and mystery in all who visit. So too does the bare stone crypt within. You will experience the powerful magnetism of the village of Taurinya as we visit the stone crypt beneath the cathedral in the shape of the Torus Donut. (Feeling your hair stand up from charge compression inside - is a good experiential intro to Toroidal Sacred Geometry!). It is from this very crypt that the town of Taurinya takes its name. If conditions permit, we are planning a visit to the world's greatest gorge/cascade swimming hole just up the dramatic Canigou from the cathedral and tiny village - a short hike you will NEVER forget! Mount Bugarach is the infamous center of all UFO activity in France. Reportedly the inspiration for the Devil's Tower climax sequence in the science fiction film "Close Encounters of the Third Kind," the inactive volcano is rumored to be both a passageway to a subterranean realm of extra-terrestrials and a landing site for UFOs so that they might pick up pilgrims who have decoded the region's mysteries. 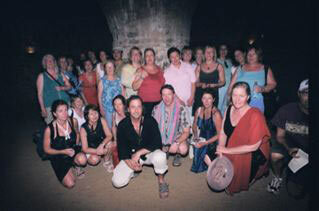 You may view additional video clips from past tours of Southern France. Physics has long spoken of the symmetry that would unify electric fields with gravity as the Holy Grail of physics. This unified field would lead to successful Fusion. Einstein understood that this symmetry connecting charge to gravity was infinite non-destructive collapse. Unfortunately for Einstein, he could not have known about fractals in his lifetime. From physics we understand that the only infinite compression is fractal. Today it is therefore a simple logical conclusion that a charge arranged in a fractal will produce gravity. We have shown extensively that the Golden Mean ratio is key to fractality in 2D as well as in higher dimensions. The physics producing a solution to Einstein's dying dilemma of infinite non-destructive compression have led Europe's leading Fusion scientists to develop a model for the gravity code - i.e., the Holy Grail of physics. The exciting part is seeing how this charge compression potentially creates fusion and communion of memory in BLOOD. This introducess a true scientific basis to understand literally - the REAL grail in the bloodline: the fractal fountain of charge fusion in DNA. Mag(da)len - literally means that Mother of Fire (Ag) in the blood. We will discuss Boudet's text on the origin of the Celtic language, and the importance of symmetry to this ancient language of the blood. We will learn how the charge compression of the sacred sites that we visit can be measured and observed to cause our blood to electrically "sing": the real SanGraal. Moreover, we will discuss how this becomes the measureable origin of lifeforce. From here we will introduce the blood survival symmetry knowledge of the ancient Dragon cultures (Celtic and Annunaki) which planted these Dolmen and attracted the Black (Rigelian) Madonna story. Imagine the drama we will feel while standing in Berenger Sauniere's home at the Rennes Mygdala tower, knowing full well why the scroll he discovered was the ultimate blackmail document not just for the church but the all the royal families of Europe who had conspired to put the "Disposyni" out of power! Finally, we will relate the Annunaki origins of kingship discussed in Gardner's Genesis of the Grail Kings to the political drama of the present. How did the ancient UR / Uru Dragon Saraphi fall into loss of blood fire - called Nephalim? Was this the true root of EA's Earth and todays wars - Enlil-Enki, Amun-Atun, IsRAel-Arab: between those who see our DNA as something to 'harvest'-versus those who would show our children's genes the way IN to REAL STARMAKING. The DIFFERENCE is self-empowerment - if YOU take charge of the physics of creation - IN YOUR BLOOD- by choosing the passion AND hygiene discipline of blood ignition - the physics of bliss. Referencing everything from MAG Dragon Queens to messiahs to the Reverent Mothers of Frank Herbert's Dune, we tell the full story in a day-long drama. This epic retelling of the real history of genes on Earth has become a growing hallmark of the advanced courses within the Implosion Group Sacred Geometry world tours. The story can be previewed at www.soulinvitation.com/enki, www.soulinvitation.com/invasion, www.soulinvitation.com/honey, www.soulinvitation.com/goddess. The telling of this story is gripping - and always evokes more excitement than we can handle in one day. Whether it's Jedi Knights checking for chloridians (implosion) in the blood, or Montauk checking for Boson Seven in DNA harmonics, or Tolkien checking to see if the Finnish/Draconic alphabet has produced the Lord of the Ring, the message is the same in your DNA. The dynamics of your blood and its ability to receive charge in a fractal - the Holy Grail - determine if you become (toroidal DNA) the Lord of the Ring.